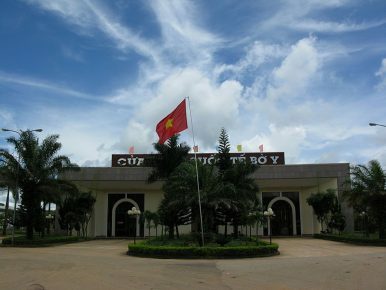 A picture of a Vietnamese border guard gate, symbolizing some of the cross-border interactions that occur at the provincial level with respect to Vietnam-Laos defense relations. Last week, Vietnam handed over a new office building to Laos. Though the development was just one among many in the capacity-building aspect of the defense relationship, it nonetheless highlighted the importance of the broader relationship between the two Southeast Asian countries. As I have noted before in these pages, Vietnam and Laos, both neighboring, one-party, communist states in Southeast Asia, share an important defense relationship as part of their broader diplomatic ties. The defense relationship has included several aspects, including Hanoi’s ongoing support of Laos’ military and managing transnational challenges, such as drug trafficking or migration, through various means including joint border patrols between the two sides including among provinces. The development of the defense relationship has continued on into 2019 as well. Indeed, just in late March, both countries had conducted yet another border patrol between their border guard forces involving the Tri Le Border Post of the Nghe An provincial Border Guard Command and militia force of Tri Le commune of Que Phong district, in association with Lao forces from Border Guard Company 217 of Laos’ Houaphanh provincial Military Command and militiamen of Daend in hamlet of Phanthong hamlet grouping of Kone district. Last week, the defense component of the relationship was in the headlines again with Vietnam’s handover of an office building to Laos. The Quang Nam provincial military command handed over an office building to the Military Command of Thateng District, Sekong province, in Laos, in the latest visible sign of Vietnam’s support for capacity-building of the Lao military. Per Vietnam’s military, the facility, which was about 564 square meters in size, was built at a cost of nearly 8 billion VND ($345,352) and was sourced from the Quang Nam provincial People’s Committee. In addition to the facility itself, the Quang Nam provincial Military Command also presented office appliances worth 50 million VND to Laos as well to support the setting up and utilization of the facility. The transfer of the facility and office supplies, which occurred on April 2, was accompanied by a handover ceremony. And other than the ceremony itself, few details were publicly released about the development, including how it would factor into Laos’ own defense and other similar potential activities further down the line as well between the two countries. Vietnam’s military only said that the construction was a vivid illustration of the significance of provincial links between the two sides and the nurturing of the bilateral friendship and comprehensive cooperation between the two countries more generally.